Bali is a treasure trove of wondrous discoveries. As you drive north from the southern coast of Bali, you will soon find yourself on a road we like to call “the craftsman’s road” because on both sides of the streets, for many kilometers are vast displays of artifacts all on sale; gold and silver shops; wood carving galleries and painting studio. A treasure trove of fascinating objects are just waiting to be discovered. And if its history is what you are looking for then some wonderful artifacts are waiting to entrance the visitor in a variety of excellent. Arrange your free day to suit yourself. Stroll through the Balinese atmosphere along the Legian Street for window shop or soak up on the resort’s pool to relax. This evening you might be celebrating your farewell, laze on the Hard Rock Cafe Bali and redeem your Meal voucher of 1 Main Course and a Glass of soft drink. This morning bid farewell to Bali, your local Tour Guide and driver. You will be transferred to the airport for your flight home. Lovina, with its fabulous black-sand beach, is an ideal place for escape. Wake-up at 0500-0530am take your booked outrigger boat to challenge the wild dolphin in the sea. Enjoy an exciting moments when the playful wild dolphins offer quite a view, start shooting your camera to this wonderful moment. The fun continued, after having shower and breakfast at hotel, short drive to Melka. Sit back and relax overlooking the Melka’s pool where the dolphins is in action to show their talent. Enjoy spectacular view of Lake Beratan and Tambulingan as you travel through the Lake area. Stop at Banjar one of the best hot springs in Bali and Bedugul for the Ulun Danu Temple built in the Lake Beratan before touching Ubud. Arrive Ubud, explore its market and goes insight to the Balinese culture, Royal Palace compound and architecture as you visit Peliatan Royal Palace. Welcomed by the Prince who will be escorting you on touring the Palace before enjoying your afternoon High Tea with an authentic Balinese Cakes, Bali Coffee and Java Tea. Heading to the southern Bali with stop at Celuk and Mas villages – the art handicraft villages of the island. Buffet Lunch served at Mentari Restaurant. Dine out tonight is authentic recipe of Balinese Crispy Duck at Ambassador Restaurant before checking-in to your hotel. 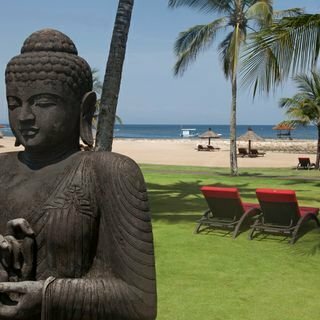 This morning visit Tanjung Benoa Beach, lies on the south-eastern coast of Bali. Still a fishing village, Tanjung Benoa over the years has developed into a major player in the tourism sector. The calm waters and the white sand beach have made Tanjung Benoa the prime water sport areas of Bali. Board on to the Glass bottom boat and sail around the south-eastern coast of Bali, bring you to explore the turtle conservation centre. There is time to opt on water sport activities at your own cost. Stroll through the bustling Kuta to Oleh Oleh Bali Merchandise Shop for bargain bunter. This early evening visit Bukit Peninsula, the side of the holy temple Uluwatu. A delicious Flying Gourame Lunch served at Pawon Pasundan Rest. Dine tonight Grill Seafood Dinner at Bawang Merah Restaurant at Kelan Beach in Jimbaran bay. Back at hotel, relax and unwind. Today, say farewell to your Local Tour Guide and Driver as you are transferred to the airport for your flight back home. Tanah Lot, is a rock formation off the island, home of a pilgrimage temple, the Pura Tanah Lot. Welcome to Bali. Relax and unwind after checking-in to your hotel. Balance the day is your free time. Consider a stroll around this enticing resort island and take in the Balinese atmosphere on your own. Today, your guided sight start with delightful drive through the bustling villages to Ubud, a town in central Bali, is far removed from the drunken bikini scene in Kuta, and is regarded as the cultural centre of Bali. Ubud is famous as an arts and crafts hub, and much of the town and nearby villages seems to consist of artists' workshops and galleries. On the road you will encounter the culture and natural beauties of Bali includes Celuk Village where intricate webs of precious metals are carved in form of Jewelry; Mas Village to encounter wooden craftsmen, Ubud Market sell a wide range of craftsmen, be it wood carving, mask, to textile product and fashion. Goa Gajah, is another heritage to visit. Built in the 9th century, it served as a sanctuary. Peliatan Royal Palace will give you an insight to Royal Balinese Culture, Palace compound and architecture. Welcomed by the Prince hosted you touring his Family Palace before the High Tea with authentic Balinese cakes served. Authentic Balinese Crispy Duck Lunch at the Pond Restaurant. Enjoy your last day at leisure. It’s time to bid farewell to Surabaya, your Local tour guide and driver. Your airport transfer is provided. Ubud, a town in central Bali, is far removed from the drunken bikini scene in Kuta, and is regarded as the cultural centre of Bal Celuk Village where intricate webs of precious metals are carved in form of Jewelry. Mas Village to encounter wooden craftsmen. Ubud Market sell a wide range of craftsmen, be it wood carving, mask, to textile product and fashion. Peliatan Royal Palace will give you an insight to Royal Balinese Culture, Palace compound and architecture. Welcomes in Bali! Soon you disembark the flight and after going through the Immigration and Custom clearance, you will be met by Diorama Ambassador, and take you to an afternoon touring to the Bukit Peninsula, the site of Pura Luhur Uluwatu which sits on 600 feet above the sea level, the ideal site to enjoy a late afternoon sunset in the Indian Ocean. Dance, music and drama are closely related in Bali, in fact many of the dances many tell a story of form. Probably the best known of the many Balinese dances is the Kechak, an unusual in that does not have a gamelan music accompaniment. Instead the background is provided by a chanting ‘Choir’ of men who verbalize the words “chak-a-chak-a-chak” in different ways to represent the chanting of monkeys. The dances telling a short episode of Ramayana Story, sometime performed by over hundred dancers play the monkey army, while the beautiful female dancers portray the main character of Dewi, Sita and Trijata. Soon the performance over, embark your coach/van and continued your evening at Kelan Beach on Jimbaran Bay, home of the famous seafood Restaurant. Sit back and relax by the ocean and enjoy your welcome dinner of Balinese Grill Seafood in Bawang Merah Restaurant. Your dishes includes: 300grm of Snapper Fish, King Prawn, Squid Kebab, and Clam accompanied with Rice, Clear Vegetables Seafood Soup, Vegetable Salad, and 3 kinds of sauces. End of your evening as we will transfer you to your selected hotel for check-in and accommodation. Balance the evening is yours. It’s time for you to explore Bali after dark at your own, don’t go too early – it’s dead at ten when the rest of Bali is thinking of sleep, and only start livening up and midnight. The seafront at Kuta is pounding from Hard Rock to Kama Sutra to Zanzibar. The street of Kuta are buzzing from Bounty to Sky Garden to Paddy’s bustling down Dyanapura, from Santa Fe to Obsession to the alternative scene at Q and surrounding bars. Enjoy your own stay at your own choice. Breakfast served in hotel from 0630am-1000am The journey takes you to the north-eastern Bali at the Mount Batur Caldera, and which encompasses Penelokan, Toya Bungkah, Batur and Kintamani Villages, is known widely as just Kintamani. Kintamani, Batur and Penelokan villages sit on the rim of the huge Batur caldera about 1,500m above sea level, and offer dramatic views of the active volcano Mount Batur and serene Lake Batur. Kintamani is also the site of Bali Coffee Plantation, new tourist attractions in Bali. The farmers are stepping into a new idea to create their coffee plantation as a tourist attraction where you may visit it with some coffee for free testing. In Bali, Dance, music and drama are closely related, in fact many of the dances rely on music to give dramatic expression. On your journey, along the road you will encounter the culture and natural beauties of Bali as you visit gold &amp; silver shops in Celuk Village where intricate webs of precious metals are carved in every known form from ornament to tea pots and Jewelry; Mas Village to encounter wooden craftsmen producing fascinating work of art and discover superb collection of art that span traditional forms to modern interpretations of classic Balinese scenes. Then you come to the artists, in and around Ubud, and you will wonder for the high quality affordable art painting, memories to hang on your wall. Shoppers will not be disappointed as you come to Ubud Market sell a wide range of craftsmen, be it wood carving, mask, to textile product and fashion. All forms of interesting gifts can be found to enrich your home or amaze your friends. The temple of Bali is as dramatic as they are beautiful. Tirta Empul Temple is a Hindu Temple in the middle of the island, famous for its holy water where Hindu Bali people go for purification.Tirta Empul Temple was built in 926 A.D. Visits Goa Gajah, is another heritage, built in the 9th century, it served as a sanctuary. The primary figure was once thought to be an elephant, hence the nickname Elephant Cave. The site is mentioned in the Javanese poem Desawarna written in 1365. In the afternoon, you will be taken into inside cultural experience as you visit the Peliatan Royal Palace. Ubud has been a "royal town" for over a hundred years. Its princes, who bear the title "Tjokorda" or "Agung" still live in traditional palaces, called "Puri’s". Be aware, however, that every place called "puri" is not a royal palace. Puri Peliatan “Palace”, used to be the Peliatan Kingdom, is a 3.5 hectare complex hiding behind its richly decorated Gates, its compound divided into tree section as a human body: A part of a family Temple as a head, a part of living room such as Sumanggen, Puri Rangki, Puri Agung, Puri Anyar, and Puri Semara bawa, as stomach, and Ancak Saji is a foots. Ancak Saji is the outsider area of Puri Peliatan, there are some building at the area, for Small meeting room, Security, Wantilan, and Open Stage. Your Palace Tour will be conducted by one of the Prince followed by enjoying your afternoon authentic Balinese Coffee and Cakes. Breakfast served in hotel from 0630am-1000am. 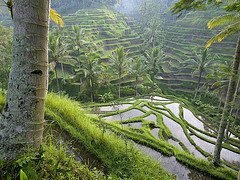 Your journey to the center-north region will encounter the fascinating country sight of Bali. Your first stop will at Mengwi Village the site of the former Royal Family Temple, Pura Taman Ayun, dating back from the 17th century. You come to Bedugul, is the name used to cover a large area of the central highlands of Bali around the villages of Bedugul itself, Candikuning, Pancasari, Pacung and Wanagiri (amongst others). This is an area of great natural beauty. The focus point of the area centres on the three crater lakes of Bratan (Beratan) and the Pura Ulun Danu Bratan Water Temple. The whole area is at an altitude of 700 metres or more, with the tallest mountain peaks above 2,000 metres, and it can be distinctly chilly here. The highlight of the journey will be Tanah Lot, is a Rock Formation off the island, home of a pilgrimage temple, the Pura Tanah Lot. The temple is claimed to be the work of a 15th century priest named Nirartha. It is believed that there are poisonous snakes at the base of the rocky island which guard the temple from evil spirits and intruders. Some people say that the there is one giant snake which also watches over the temple. Breakfast served in hotel from 0630am-1000am. You are free for the day, take this opportunity to shop for last minute souvenir shopping in the surrounding shopping complex or mall closest to your hotel. In time of your departure, you will be met by Diorama Ambassador and assist you to the airport for your flight back to your home country. Bali Aqua is a 5 Star PADI Dive Center which offers daily trip around Bali, safari around Bali island and snorkeling tour and PADI dive courses. Drive to Tulamben &amp; do 2 dives at Liberty Wreck (Add on Afternoon / Night dive at Liberty wreck). Overnight at Tulamben. Drive to Padang Bai &amp; do 2 dives at Padang Bai. Drive to Sanur. Overnight at Sanur. Dives at Nusa Penida island – Manta Point, Mola-Mola Point, Mangrove Point. Arrive Sanur 15:00. Set in picturesque gardens with cool sea breezes, relax and enjoy the international cuisine in the open air restaurant, overlooking the crystal water of the pool and watch the sunset on the horizon over the beautiful sea. Situated on Kuta Tuban Beach it is only a 5 minute pleasant walk along the sandy beach into the heart of Kuta. Taman Ayun Temple,, second largest temple, Shopping, Joger Art Shop, Alas Kedaton, main attraction, monkeys, Tanah Lot,, sunset, Teuku Umar Garden Restaurant. Arrival at Ngurah Rai International Airport, Bali. Met and Greeted with our guide. Transfer to GWK (Garuda Wisnu Kencana) for looking a colaboration of Kecak Dance Performance, followed by Dinner at the restaurant. Check-in hotel. Free Time. Breakfast at hotel. In the morning drive to Batubulan for watching Barong Dance, a dragon like holy animal battles against the evil witch Rangda. Shopping at Galuh Art Shop, Celuk and Mas (Center of Wood and Silver). Lunch at Kintamani area with Lake and Mount Batur. After lunch visit to Tampak Siring, a famous with Holy Springs water. In the afternoon travel back to Ubud and visit to Sukowati Traditional Market. Diner at Jimbaran Beach with seafood menu. Back to hotel and free program. Breakfast at hotel. Fullday tour to Bedugul Area. Visit to Taman Ayun Temple, the second largest temple in Bali as the legacy of Mengwi Kingdom. Shopping at Joger Art Shop. Lunch at Bedugul area. After lunch visit to Alas Kedaton, the main attraction is the monkeys, unique only to Bali, which live among the nutmeg trees. In the afternoon, drive to Tanah Lot, the best place to see sunset. Dinner at Teuku Umar Garden Restaurant. Back to hotel and free program. Breakfast at hotel. After process check-out. Today visit to Tanjung Benoa. Enjoy with water sports activities (personal cost). Lunch will be provide at the restaurant. Then transfer you to the airport for your next flight. Tour ends. Tour to Bedugul and Jati Luwih offers you cool and pleasant climate up to 18oC. Here, all visitors will be pampered by the superb view overlooking the lake, the complete botanical garden, as well as the graceful temple. The quest begins by visiting Tohpati which is famous as Batik center while enjoying the Batik making process. Then the journey continued to visit artistic village of Batubulan to see the authentic stone carvings and sculptures made by the skilful local Balinese. The other sights for this our package including Taman Ayun, Candi Kuning, Bedugul Botanical Garden, and Jatiluwih which are the most recommended places when you are touring to the middle part of the island. Tohpati (Center of Batik, hand weaving/making batik) Tohpati is widely known as the center of handmade Balinese batik with various colors and shapes. Here the visitors will be exhibited the Batik making and hand weaving process. Finally you can buy some to bring home. The specialties of Balinese Batik can be seen from the strong Javanese motifs; some of modern Batik applies the paintings objects, such as Balinese culture, ceremonies, beautiful sites, or mythological figures. Batik is one of the most beautiful wearable art and the approach to the other side of Balinese rich culture. Batubulan Batubulan is an agricultural village which gains fame for its arts activities including stone carving and dancing. The area is part of Sukawati district, Gianyar regency only approximately 10 kilometers from Denpasar city. All stone carvers from Batubulan are experts in making such artistic and adorable items that are mostly displayed in the houses, temples, resorts, hotels, or villas in Bali. When you enter the Batubulan village, you will catch the welcome stone building as the hallmark of Batubulan as the center of stone carving in Bali. Taman Ayun To reach Pura Taman Ayun you just need to drive for about 18 kilometers to the north from Denpasar city center, precisely in the midway between Denpasar and Singaraja. The site is a Royal Temple of Mengwi Dynasty built in the seventeenth century, boasting the wonderful temple building with typical roof as well as Balinese Architecture. The Pura Taman Ayun means the garden temple in the water. As one of the most prominent temple on the island, the Pura Taman Ayun is respected not only the divinities it was built for the first time for, also this sacred and beautiful temple is built for such great festivals and all religious events. Candikuning (fruit and flower village market) Besides as a worship place, Candikuning is also popular for the fruit and flower plantations and harvests. The visitors can visit the Candikuning village market to buy the fresh mango, banana, papaya, avocado, orange, as well as various spices, flowers, vegetables, handicrafts, paintings, and fabrics. If you love rabbits, here you can buy the cute one at the price you will be happy to pay. In the entire surroundings you can find loads of public facilities, local restaurants, accommodations, and more. The site is within short stroll to Bedugul Botanical Garden and Beratan Lake. Ulundanu temple Ulun Danu Temple Beratan is opened for Visitors If we look into the location, this temple is located in Beratan lakeside and it was the unique Bali Temple in Bali which are now many tourists paying a visit to this place. It is situated in the plateau area and surrounded by cold weather and owns the magnificent view which makes impression for every visitor. It is strategically located beside the main road from Denpasar to Singaraja. It is very easy to locate this temple by following the main road with the good access. Jatiluwih (rice terrace) Tranquilly situated 48 kilometers from Denpasar city, Jatiluwih is a place to go whenever you need fresh weather, majestic view of the extensive terrace rice fields. The most enchanting natural attraction in Jatiluwih is the terrace rice field back-grounded and beautified by mountain with its tropical forest and greeneries. What makes the paddies harvests in Jatiluwih different than in the other places is that the Jatiluwih paddies are popular for their big size and the highest quality. Also, Jatiluwih is renowned for its organic agriculture system. In addition, the people often visit Petali Temple on the upper land of the village to watch the Wali Pendet, a sacred dance performed to celebrate the anniversary of the temple. Lovina, with its fabulous black-sand beach, is an ideal place for escape. Wake-up at 0500-0530am take your booked outrigger boat to challenge the wild dolphin in the sea. Enjoy an exciting moments when the playful wild dolphins offer quite a view, start shooting your camera to this wonderful moment. The fun continued, after having shower and breakfast at hotel, short drive to Melka. Sit back and relax overlooking the Melka’s pool where the dolphins is in action to show their talent. Enjoy spectacular view of Lake Beratan and Tambulingan as you travel through the Lake area. Stop at Banjar one of the best hot springs in Bali and Bedugul for the Ulun Danu Temple built in the Lake Beratan before touching Ubud. Arrive Ubud, explore its market and goes insight to the Balinese culture, Royal Palace compound and architecture as you visit Peliatan Royal Palace. Welcomed by the Prince who will be escorting you on touring the Palace before enjoying your afternoon High Tea with an authentic Balinese Cakes, Bali Coffee and Java Tea. Heading to the southern Bali with stop at Celuk and Mas villages – the art * handicraft villages of the island. Buffet Lunch served at Mentari Restaurant. Dine out tonight is authentic recipe of Balinese Crispy Duck at Ambassador Restaurant before checking-in to your hotel. Dives at Tulamben area for Macro. Drive to Sanur. Overnight at Sanur. Drive to Padang Bai &amp; do 2 dives at Padang Bai. Overnight at Sanur. Choosing a right place to spend your holiday after working hard every day can relieve fatigue from your mind and soul. Therefore, a holiday in Bali is a popular choice for many domestic and overseas travellers. Besides being well known for its beautiful beaches and culture, there are a lot of tourist destinations in Bali ready to give you a remarkable vacation to remember. Fascinating tourist places to visit are widely spread over Bali Island. Starting from North Bali, you can stop by Taman Ayun, Pacung, Air Terjun Gitgit, Lovina Beach, Lake Tamblingan, and Lake Buyan. Moving forward to West Bali, you can surf in Medewi Beach, enjoy the Rambut Siwi Temple and Air Terjun Munduk. 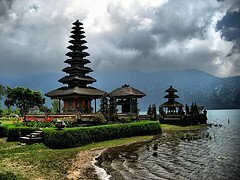 There are also incredible places in East Bali, such as Kintamani Village, Lake Batur, Besakih Temple, and Tirta Gangga. Don't forget to visit South Bali which offers many breathtaking places, like Kuta Beach, Jimbaran, Nusa Dua, Tanjung Benoa, Uluwatu, and Garuda Wisnu Kencana. Tourist destinations in Central Bali are as interesting as other areas - there is Art Market Sukawati, Goa Gajah, Monkey Forest Ubud, Bedugul, Tanah Lot, and Tampak Siring Temple. There are many tour agents that provide tour packages with those popular places listed in their itinerary so you can enjoy the enchantment of those places without burning a hole in your pocket. Bali is a popular tourist destination that is well-loved by many tourists around the world. In addition to its preserved cultural heritage, the beauty of its nature also attracts many tourists. Most of the tourist destinations in Bali has world-class standard while preserving the richness of Bali culture. So, what are you waiting for? 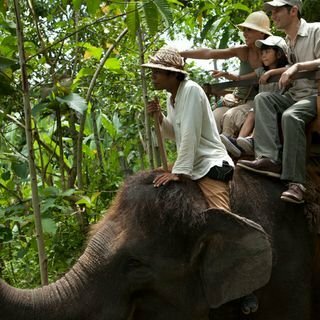 Feel the charm of Bali tourism now!